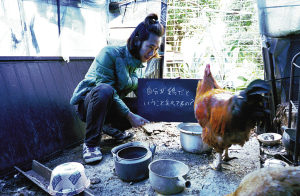 Between June-Decmber 2006 at the time when Japan and Asia were gripped by the bird flu epidemic I undertook, as an experiment, to converse with a chicken, visiting it each day with black board and chalk. I would read from the newspaper and explain the news occurring throughout the world. At this time I explained the Iraq war, the American presidential election and devastation caused by typhoons. Internally questioning how might they interpret our tragedies, through a chicken I talked to myself, to answer my own question. From the impossibility of this conversation I examine what our actual definition of communication is.